Borgeson's single-needle bearing steering U-joints are machined from steel, stainless steel, or aluminum on CNC equipment. Continued engineering and testing ensure the Borgeson U-joints meet or exceed current production vehicle requirements, and they operate at angles up to 35°. For example, a GM column can easily be connected to a new Mustang rack & pinion or a Ford column to a Saginaw box. Recommended for street use, Borgeson needle bearing joints last as much as 10 times longer than non-needle bearing joints. There's no backlash or radial play; joints are permanently lubricated/sealed, needing little to no maintenance. 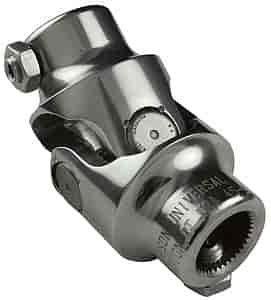 Using a Borgeson double needle bearing universal joint can negotiate angles over 35º. Available in steel, stainless steel, and aluminum, these doubles accommodate angles up to 70º and are available in all spline and DD configurations. Note: Using a double joint in addition to a single will require a steering shaft support bearing.